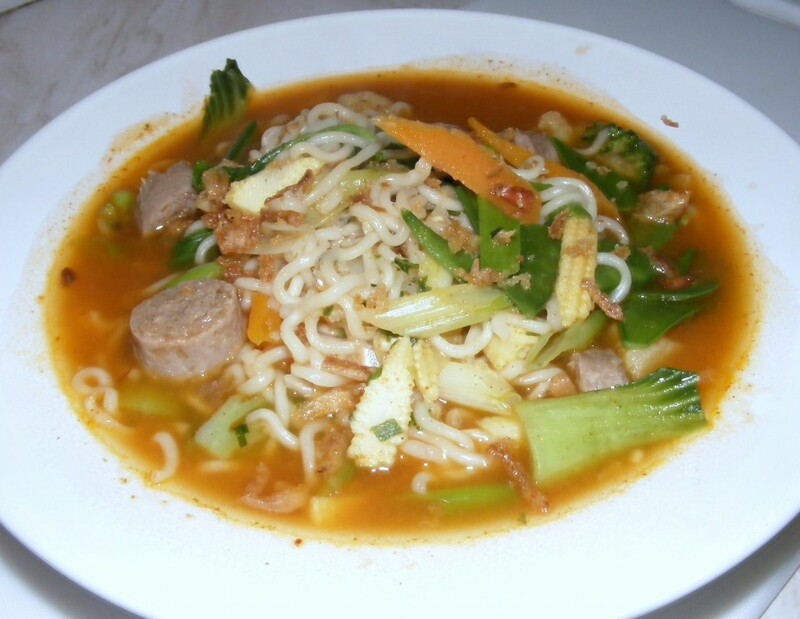 The great thing about this recipe is that it's not really a recipe at all - more of a guide to turning instant noodles from a snack into a substantial meal that takes well under 10 minutes to cook and probably costs under a quid. You can use just about any vegetables you have to hand, and any kind of instant noodles (well, perhaps not Pot Noodles, but who knows..). We're lucky in that our local Tesco has a great variety of imported instant noodles, mostly from Japan, Thailand and Taiwan (they sometimes have the Indonesian 'Indomie' brand too - these are quite small packets, though). Our current favourite is the Thai 'Mama' brand, mainly because the sauce is incredibly fiery - the Hot and Spicy variety we use here is top-of-the-range in that respect. But if you don't like things too hot, just ditch the sachet of chilli power. The 'Kimchi' flavour is not quite so hot. These particular noodles come with a few small packets of stuff inside - some dried vegetables, soup base and chilli powder. Others will vary. Mrs K generally puts the lot in. Although you can use whatever you have to hand, as an example we'll list what we used for the overflowing bowl above. This will feed one person the size of Mr K, or the population of a small village. 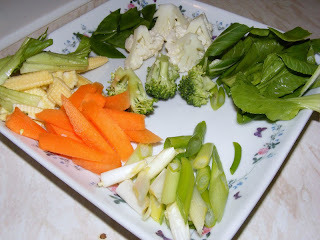 Chop the vegetables roughly - as a general rule, the harder the vegetable the smaller the pieces, the aim being for them all to take about the same time to cook. Use the photo below as a guide. Put about 400ml of water into a small saucepan and bring it to the boil (note that you will a bit need more water than required by the instructions on the noodle packet). Pop in the sausage and boil it for 3 minutes. Take it out and peel off the skin, then cut the sausage into half-inch chunks. Put these back in the water. Put in the carrots and simmer for a minute before putting in the sweetcorn, broccoli and cauliflower. 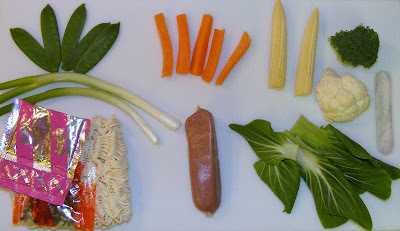 After another minute, put in the noodles (break these into four first to make it easier). Simmer for about 3 minutes or until the carrots are tender. 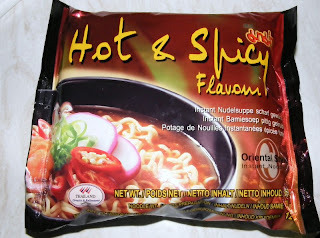 Add whatever packet sof sauce and flavourings come with noodles and stir in well. Add the tomato ketchup and stir in (this just gives it a better colour). Finally put in the spring onion and pak choi, simmer for 30 seconds and it's ready. 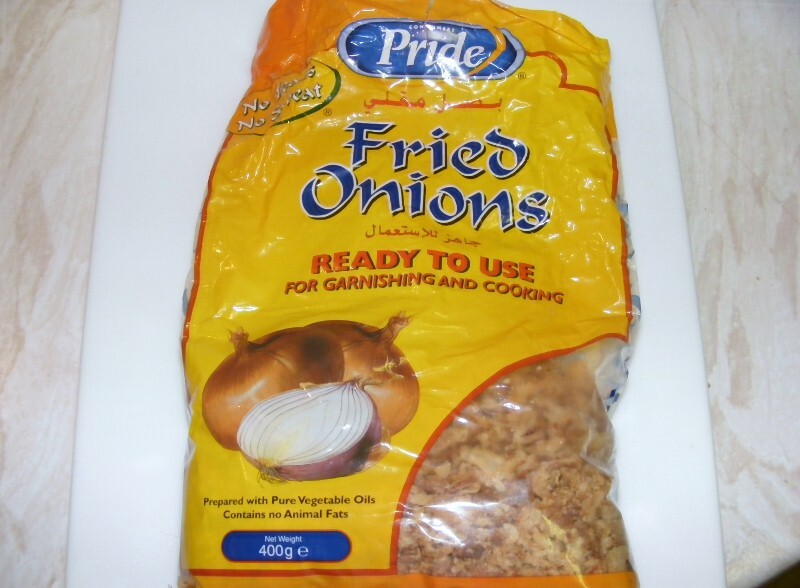 As a final touch, Mrs K likes to sprinkle fried onions on the top when it's served - you can get these in most supermarkets, often labelled 'crunchy onion bits' or 'salad topping' or something like that. The huge packet below is from our local Chinese store and cost a couple of pounds.